Thank you for visiting our new Internet site. The emphasis of our site is our mission to inspire, educate, and create awareness of the natural ice industry of long ago. Make sure you check this site regularly for updates. In brief, you should know the following about us: The organization was established in 1987 and is a non-profit 501c3 charitable foundation led by a board of trustees. 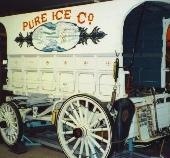 The ice museum is located in downtown Port Huron at 317 Grand River Ave., Port Huron, Michigan 48060. The ice museum is open to the public all year! Hours are: June thru September - Thursdays, Fridays, and Saturdays from 11am - 5pm, October thru May - Saturdays from 11am - 5pm. In addition, groups of ten or more can make a special appointment most any day at most anytime. Call (810) 987-5441. Beginning January 1, 2012 admission is: $5.00 for adults, $4.00 for seniors, $2.00 for children ages 6 -12, and 5 & under are FREE. Just imagine natural ice harvesting was one of the ten largest U.S. industries at one time. Michigan and other Great Lakes states were once major ice suppliers to the rest of the world by utilizing the natural resources of frozen lakes and rivers. At 10,000 sq. ft. the Knowlton's Ice Museum of North America has one of the largest collections in the U.S. of ice tools and implements from the mid-1800's to the early 1900's - a time when most American households had an ice box and the ice delivery man delivered ice by horse and wagon. The ice museum is one of only a few museums in the world that depicts the natural ice industry of long ago. Visitors can view rare video footage of a real 1920s ice harvest, see over 5,000 items, and have a try at the hands-on activities. Make sure you visit the Knowlton's Ice Museum of North America real soon!